Airbus Defence and Space delivered the first structural test model (STA) of the Orion service module, to NASA’s Plum Brook Station test centre in Sandusky, Ohio (USA). The hardware is the first of a series of service modules developed and built by Airbus Defence and Space on behalf of the European Space Agency (ESA) to provide the propulsion, energy supply and central elements of the life support system to NASA’s future crewed spacecraft Orion. “The delivery of the structural test module marks an important milestone for the Orion programme and for Airbus Defence and Space, the first European supplier of a critical system to a crewed US mission in Space. I am very proud that the unequalled expertise of our teams, built-on the ATV successful missions, has been recognised and will be used over the next decades to contribute to the future crewed deep space missions,” said François Auque, Head of Space Systems. After the initial static tests of this structure at Thales Alenia Space plant in Turin, a series of dynamic tests essential for building the flying model of the Orion service module (ESM) will now be carried out at the NASA centre. These tests simulate conditions such as the loads and stresses that occur during a launch. In addition, the test results aim to determine whether structural and mass requirements are consistent with calculations and whether the service module satisfies NASA’s crew safety standards. The STA is an exact replica of the Orion service module, but without its functionality. It is the first time that Europe has been involved in providing system-critical elements for a US crewed deep-space exploration project. 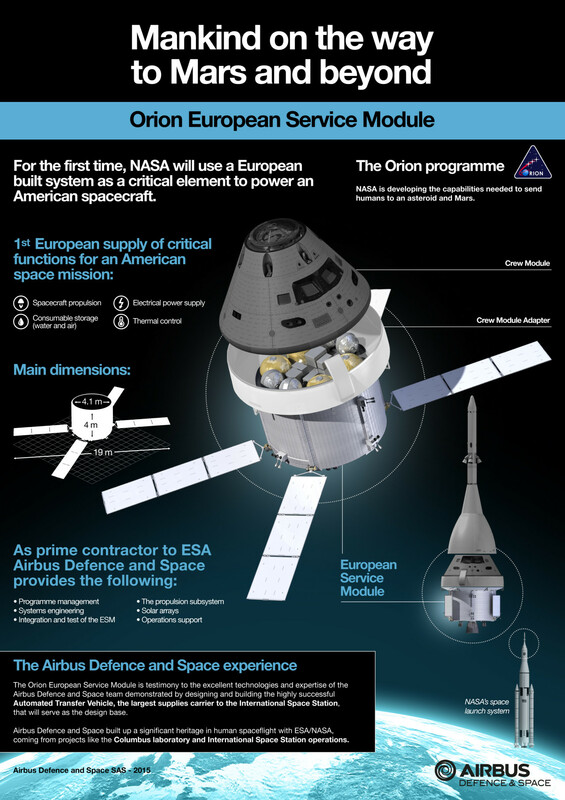 In December 2012, NASA and the European Space Agency agreed to certify the European service module in conjunction with the new US Orion spacecraft. This module is based on the design and the lessons learned from the automated transfer vehicle (ATV), which was also developed and constructed by Airbus Defence and Space on behalf of ESA as a supply craft for the International Space Station. The plan is to use the Orion spacecraft for crewed missions to the Moon, to asteroids and into the depths of space. Lockheed Martin Space Systems is developing and building the space capsule for four or more astronauts on behalf of NASA. The ESM service module will propel the spacecraft, supply it with power and provide the main elements of its life support system. Exploration Mission-1 will be Orion’s first planned unmanned mission to a Lunar distant retrograde orbit and return to Earth. The aim of this mission is not only to demonstrate the spacecraft’s performance capabilities before its crewed deployment, but also to achieve qualification for NASA’s new Space Launch System. As part of Exploration Mission-2, the Orion is then scheduled to be launched into space not earlier than 2020 with astronauts on board.